$2.00 per axle for passenger vehicles ($4.00 per car). $5.00 per axle for motor homes, and commercial vehicles. The Mackinac Bridge connects St. Ignace and Mackinaw City. The Mackinac Bridge (/ˈmækɪnɔː/ MAK-in-aw) is a suspension bridge spanning the Straits of Mackinac to connect the Upper and Lower Peninsulas of the U.S. state of Michigan. Opened in 1957, the 26,372-foot-long (4.995 mi; 8.038 km) bridge (familiarly known as "Big Mac" and "Mighty Mac") is the world's 20th-longest main span and the longest suspension bridge between anchorages in the Western Hemisphere. The Mackinac Bridge is part of Interstate 75 and the Lakes Michigan and Huron components of the Great Lakes Circle Tour across the straits; it is also a segment of the U.S. North Country National Scenic Trail. The bridge connects the city of St. Ignace on the north end with the village of Mackinaw City on the south. Envisioned since the 1880s, the bridge was designed by the engineer David B. Steinman and completed in 1957 only after many decades of struggles to begin construction. The bridge opened on November 1, 1957, connecting two peninsulas linked for decades by ferries. A year later, the bridge was formally dedicated as the "world's longest suspension bridge between anchorages", allowing a superlative comparison to the Golden Gate Bridge, which had a longer center span between towers, and the San Francisco–Oakland Bay Bridge, which had an anchorage in the middle. It remains the longest suspension bridge with two towers between anchorages in the Western Hemisphere. Much longer anchorage-to-anchorage spans have been built in the Eastern Hemisphere, including the Akashi Kaikyō Bridge in Japan (6,532 ft or 1,991 m). But the long leadups to the anchorages on the Mackinac make its total shoreline-to-shoreline length of five miles (8.0 km), longer than the Akashi-Kaikyo (2.4 mi or 3.9 km). The length of the bridge's main span is 3,800 feet (1,158 m), which makes it the third-longest suspension span in the United States and 20th longest suspension span worldwide. It is also one of the world's longest bridges overall. The Algonquian peoples who lived in the straits area prior to the arrival of Europeans in the 17th century called this region Michilimackinac, which is widely understood to mean the Great Turtle. This is thought to refer to the shape of what is now called Mackinac Island. This interpretation of the word is debated by scholars. Trading posts at the Straits of Mackinac attracted peak populations during the summer trading season; they also developed as intertribal meeting places. As exploitation of the state's mineral and timber resources increased during the 19th century, the area became an important transport hub. In 1881 the three railroads that reached the Straits, the Michigan Central, Grand Rapids & Indiana, and the Detroit, Mackinac & Marquette, jointly established the Mackinac Transportation Company to operate a railroad car ferry service across the straits and connect the two peninsulas. Improved highways along the eastern shores of the Lower Peninsula brought increased automobile traffic to the Straits region starting in the 1910s. The state of Michigan initiated an automobile ferry service between Mackinaw City and St. Ignace in 1923; it eventually operated nine ferry boats that would carry as many as 9,000 vehicles per day. Traffic backups could stretch as long as 16 miles (26 km). After the opening of the Brooklyn Bridge in 1883, local residents began to imagine that such a structure could span the straits. In 1884, a store owner in St. Ignace published a newspaper advertisement that included a reprint of an artist's conception of the Brooklyn Bridge with the caption "Proposed bridge across the Straits of Mackinac". The idea of the bridge was discussed in the Michigan Legislature as early as the 1880s. At the time, the Straits of Mackinac area was becoming a popular tourist destination, especially following the creation of Mackinac National Park on Mackinac Island in 1875. At a July 1888 meeting of the board of directors of the Grand Hotel on Mackinac Island, Cornelius Vanderbilt II proposed that a bridge be built across the straits, of a design similar to the one then under construction across the Firth of Forth in Scotland. This would advance commerce in the region and help lengthen the resort season of the hotel. Decades went by with no formal action. In 1920, the Michigan state highway commissioner advocated construction of a floating tunnel across the Straits. At the invitation of the state legislature, C. E. Fowler of New York City put forth a plan for a long series of causeways and bridges across the straits from Cheboygan, 17 miles (27 km) southeast of Mackinaw City, to St. Ignace, using Bois Blanc, Round, and Mackinac islands as intermediate steps. Michigan is unifying itself, and a magnificent new route through Michigan to Lake Superior and the Northwest United States is developing, via the Straits of Mackinac. It cannot continue to grow as it ought with clumsy and inadequate ferries for any portion of the year. By 1928, the ferry service had become so popular and so expensive to operate that Michigan Governor Fred W. Green ordered the department to study the feasibility of building a bridge across the strait. The department deemed the idea feasible, estimating the cost at $30 million (equivalent to $352 million in 2018). In 1934, the Michigan Legislature created the Mackinac Straits Bridge Authority to explore possible methods of constructing and funding the proposed bridge. The Legislature authorized the Authority to seek financing for the project. In the mid-1930s, during the Great Depression, when numerous infrastructure projects received federal aid, the Authority twice attempted to obtain federal funds for the project but was unsuccessful. The United States Army Corps of Engineers and President Franklin D. Roosevelt endorsed the project but Congress never appropriated funds. Between 1936 and 1940, the Authority selected a route for the bridge based on preliminary studies. Borings were made for a detailed geological study of the route. The preliminary plans for the bridge featured a 3-lane roadway, a railroad crossing on the underdeck of the span, and a center-anchorage double-suspension bridge configuration similar to the design of the San Francisco – Oakland Bay Bridge. Because this would have required sinking an anchorage pier in the deepest area of the Straits, the practicality of this design may have been questionable. A concrete causeway, approximately 4,000 feet (1,219 m), extending from the northern shore, was constructed in shallow water from 1939 to 1941. However, a unique engineering challenge was created by the tremendous forces that operate against the base of the bridge, because the lakes freeze during the winter, causing large icebergs to place enormous stress on the bridge. At that time, with funding for the project still uncertain, further work was put on hold because of the outbreak of World War II. The Mackinac Straits Bridge Authority was abolished by the state legislature in 1947, but the same body created a new Mackinac Bridge Authority three years later in 1950. In June 1950, engineers were retained for the project. By then, it was reported that cars queuing for the ferry at Mackinaw City did not reach St. Ignace until five hours later, and the typical capacity of 460 vehicles per hour could not match the estimated 1600 for a bridge. After a report by the engineers in January 1951, the state legislature authorized the sale of $85 million (equivalent to $658 million in 2018) in bonds for bridge construction on April 30, 1952. However, a weak bond market in 1953 forced a delay of more than a year before the bonds could be issued. David B. Steinman was appointed as the design engineer in January 1953 and by the end of 1953, estimates and contracts had been negotiated. A Civil Engineer at the firm, Abul Hasnat, did the preliminary plans for the bridge. Total cost estimate at that time was $95 million (equivalent to $726 million in 2018) with estimated completion by November 1, 1956. Tolls collected were to pay for the bridge in 20 years. Construction began on May 7, 1954. The American Bridge Division of United States Steel Corporation was awarded a contract of more than $44 million (equivalent to $333 million in 2018) to build the steel superstructure. Construction, staged using the 1939–41 causeway, took three and a half years (four summers, no winter construction) at a total cost of $100 million and the lives of five workers. Contrary to popular belief, none of them are entombed in the Bridge. It opened to traffic on schedule on November 1, 1957, and the ferry service was discontinued on the same day. The Bridge was formally dedicated on June 25, 1958. G. Mennen Williams was governor during the construction of the Mackinac Bridge. He began the tradition of the governor leading the Mackinac Bridge Walk across it every Labor Day. U.S. Senator Prentiss M. Brown has been called the "father of the Mackinac Bridge," and was honored with a special memorial bridge token created by the Mackinac Bridge Authority. The bridge officially achieved its 100 millionth crossing exactly forty years after its dedication, on June 25, 1998. The 50th anniversary of the bridge's opening was celebrated on November 1, 2007 in a ceremony hosted by the Mackinac Bridge Authority at the viewing park adjacent to the St. Ignace causeway. View of a bridge tower. 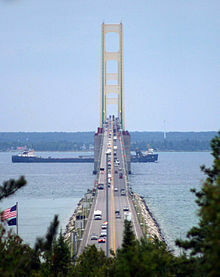 The design of the Mackinac Bridge was directly influenced by the lessons from the first Tacoma Narrows Bridge, which failed in 1940 because of its instability in high winds. Three years after that disaster, Steinman had published a theoretical analysis of suspension-bridge stability problems, which recommended that future bridge designs include deep stiffening trusses to support the bridge deck and an open-grid roadway to reduce its wind resistance. Both of these features were incorporated into the design of the Mackinac Bridge. The stiffening truss is open to reduce wind resistance. The road deck is shaped as an airfoil to provide lift in a cross wind, and the center two lanes are open grid to allow vertical (upward) air flow, which fairly precisely cancels the lift, making the roadway stable in design in winds of up to 150 miles per hour (240 km/h). The Mackinac Bridge is currently a toll bridge on Interstate 75 (I-75). Prior to the coming of I-75, the bridge carried US Highway 27 (US 27). It is one of only three segments of I-75 that are tolled, the others being the American half of the International Bridge near Sault Ste. Marie, Michigan, and Alligator Alley in Florida. The current toll is $4.00 for automobiles and $5.00 per axle for trucks. The Mackinac Bridge Authority raised the toll in 2007 to fund a $300 million renovation program, which would include completely replacing the bridge deck. Every Labor Day, the bridge is open to walkers for the Mackinac Bridge Walk. Painting of the bridge takes seven years, and when painting of the bridge is complete, it begins again. The current painting project began in 1999 and was expected to take 20 years to complete because the lead-based paint needs to be removed, incurring additional disposal requirements. The bridge celebrated its 150 millionth vehicle crossing on September 6, 2009. Length from cable bent pier to cable bent pier: 7,400 feet (2,256 m). Width of stiffening truss in the suspended span: 68 feet (20.7 m). Height of the roadway at mid-span: approximately 200 feet (61 m) above water level. 155 feet (47 m) at the center of the main suspension span. 135 feet (41 m) at the boundaries of the 3,000 feet (914 m) wide navigation channel. Total length of wire in main cables: 42,000 miles (68,000 km). Speed limit: 45 miles per hour (72 km/h) for passenger cars, 20 miles per hour (32 km/h) for heavy trucks. Heavy trucks are also required to leave 500 feet (150 m) spacing ahead. Five workers died during the construction of the bridge. Diver Frank Pepper ascended too quickly from a depth of 140 feet (43 m) on September 16, 1954. Despite being rushed to a decompression chamber, the forty-six-year-old died from the bends. Twenty-six-year-old James LeSarge lost his balance on October 10, 1954, and fell into a caisson. He fell 40 feet (12 m) and likely died of head injuries caused by impact with the criss-crossing steel beams inside the caisson. Albert Abbott died on October 25, 1954. The forty-year-old fell four feet (1.2 m) into the water while working on an 18-inch (46 cm) wide beam. Witnesses speculate he suffered a heart attack. Twenty-eight-year-old Jack Baker and Robert Koppen died in a catwalk collapse near the north tower on June 6, 1956. Koppen's body was never recovered. For both it was their first day on the job. All five men are memorialized on a plaque near the bridge's northern end (Bridge View Park). Contrary to folklore, no bodies are embedded in the concrete. One worker has died since the bridge was completed. Daniel Doyle fell 60 to 70 feet (18 to 21 m) from scaffolding on August 7, 1997. He survived the fall but fell victim to the 50 °F (10 °C) water temperature. His body was recovered the next day in 95 feet (29 m) of water. Two vehicles have fallen off the bridge. On September 22, 1989, Leslie Ann Pluhar died when her 1987 Yugo plunged over the 36-inch-high (91 cm) railing. A combination of high winds and excessive speed was initially blamed. Later investigation showed the driver had stopped her car over the open steel grating on the bridge's span and that a gust of wind through the grating blew her vehicle off the bridge, although this is not supported by recorded wind speed measurements taken on and around the bridge at the time of the accident. On March 2, 1997, Richard Alan Daraban drove a 1996 Ford Bronco over the edge. It was later determined to be a suicide. On September 10, 1978, a small private plane carrying United States Marine Corps Reserve officers Maj. Virgil Osborne, Capt. James Robbins, and Capt. Wayne W. Wisbrock smashed into one of the bridge's suspension cables while flying in a heavy fog. The impact tore the wings off the plane, which then plunged into the Straits of Mackinac. All three men were killed. Because the bridge is not accessible to pedestrians,[a] suicides by jumping from the bridge have been rare, with the most recent confirmed case taking place on December 31, 2012. There have been roughly a dozen suicides by people jumping off the bridge. Some individuals have difficulty crossing bridges, a phenomenon known as gephyrophobia. The Mackinac Bridge Authority has a Drivers Assistance Program that provides drivers for those with gephyrphobia, or anyone who is more comfortable having someone else drive them across. More than a thousand people use this service every year. Those interested can arrange, either by phone or with the toll collector, to have their cars or motorcycles driven to the other end. There is no additional fee for this service. Bicycles and pedestrians are not normally permitted on the bridge. An exception is allowed for riders of two annual bicycle tours. On an everyday basis, for a $5.00 fee, the Authority will transport bicyclists and their vehicles across the bridge. Travelers across the Mackinac Bridge can listen to an AM radio broadcast that recounts the history of the bridge and provides updates on driving conditions. The Mackinac Bridge Walk has been held each year since 1958, when it was led by Governor G. Mennen Williams. The first walk was held during the Bridge's Dedication Ceremony held in late June, and has been held on Labor Day since 1959. Until 2018, school buses from local districts transported walkers from Mackinaw City to St. Ignace to begin the walk. Thousands of people, traditionally led by the Governor of Michigan, cross the five-mile (8 km) span on foot from St. Ignace to Mackinaw City. Before 1964, people walked the Bridge from Mackinaw City to St. Ignace. Prior to 2017, two lanes of the bridge would remain open to public vehicle traffic; this policy was changed in 2017 to close the entire bridge to public vehicle traffic for the duration of the event. The Bridge Walk is the only day of the year that hikers can hike this section of the North Country National Scenic Trail. A Mackinac Island ferry passing in front of the Mackinac Bridge. During summers, the Upper Peninsula and the Mackinac Bridge have become a major tourist destination. In addition to visitors to Mackinac Island, the bridge has attracted interest from a diverse group of tourists including bridge enthusiasts, bird-watchers, and photographers. The Straits area is a popular sailing destination for boats of all types, which make it easier to get a closer view to the underlying structure of the bridge. On June 25, 1958, to coincide with the 1958 celebration of the November 1957 opening, the United States Postal Service (USPS) released a 3¢ commemorative stamp featuring the recently completed bridge. It was entitled "Connecting the Peninsulas of Michigan" and 107,195,200 copies were issued. The USPS again honored the Mackinac Bridge as the subject of its 2010 priority mail $4.90 stamp, which went on sale February 3. The bridge authority and MDOT unveiled the stamp, which featured a "seagull's-eye view" of the landmark, with a passing freighter below. Artist Dan Cosgrove worked from panoramic photographs to create the artwork. This is one of several designs that Cosgrove has produced for the USPS. On April 24, 1959, Captain John S. Lappo, an officer in the Strategic Air Command, operating from Lockbourne AFB flew his Boeing B-47 Stratojet beneath the bridge. Following a General court-martial, he was grounded for life. A feature-length documentary entitled Building the Mighty Mac was produced by Hollywood filmmaker Mark Howell in 1997 and was shown on PBS. The program features numerous interviews with the key people who built the structure and includes restored 16mm color footage of the bridge's construction. The history and building of the bridge was featured in a 2003 episode of the History Channel TV show Modern Marvels. On July 19, 2007, the Detroit Science Center unveiled an 80-foot-long (24 m), 19-foot-tall (5.8 m) scale model of the Mackinac Bridge. The exhibit was part of the state's 50th anniversary celebration of the bridge. 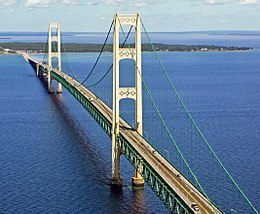 Sherwin-Williams supplied authentic Mackinac Bridge-colored paint for the project. The bridge and its maintenance crew were featured in an episode of the Discovery Channel TV show Dirty Jobs on August 7, 2007. Host Mike Rowe and crew spent several days filming the episode in May 2007. MDOT also featured the bridge on the cover of the 2007 state highway map to celebrate its 50th anniversary. ^ Excepting the Labor Day bridge walk. ^ a b c d e f g h i j k l m n o p q r s t u v w Mackinac Bridge Authority (n.d.). "Facts & Figures". Mackinac Bridge Authority. Retrieved January 22, 2018. ^ a b c Mackinac Bridge Authority (2010). "Mackinac Bridge Fare Schedule". Mackinac Bridge Authority. Archived from the original on December 22, 2009. Retrieved January 30, 2010. ^ ""Mighty Mac" Bridge Run". St. Ignace Chamber of Commerce. 2017. Retrieved September 8, 2017. ^ a b Mackinac Bridge Authority (2010). "About the Bridge". Mackinac Bridge Authority. Archived from the original on December 22, 2009. Retrieved January 30, 2010. ^ Rubin (1958), p. 14. ^ "Mackinaw, Mackinac Straits, Mackinac Island". Michilimackinac. Archived from the original on September 25, 2013. Retrieved November 2, 2013. ^ Michigan Department of Transportation. "I-75 / Straits of Mackinac". Michigan's Historic Bridges. Michigan Department of Transportation. Retrieved November 2, 2013. ^ American Society of Civil Engineers. "Mackinac Bridge". American Society of Civil Engineers. Archived from the original on October 31, 2013. Retrieved December 5, 2013. ^ a b Michigan Department of Transportation. "History". Michigan Department of Transportation. Retrieved November 2, 2013. ^ Rubin (1958), p. 13. ^ a b c d e Thomas, Ryland; Williamson, Samuel H. (2019). "What Was the U.S. GDP Then?". MeasuringWorth. Retrieved April 6, 2019. United States Gross Domestic Product deflator figures follow the Measuring Worth series. ^ Rubin (1958), p. 23. ^ Ammann, Othmar (January 10, 1951). Proposed Mackinac Straits Bridge Preliminary Report (PDF) (Report). Retrieved April 15, 2013. ^ "Mackinac Bridge Will Rival Golden Gate". Popular Mechanics. 100 (2): 132. August 1953. ISSN 0032-4558. Retrieved February 21, 2012. ^ Mackinac Bridge Authority. "In Memory of: Bridge Workers". Mackinac Bridge Authority. Archived from the original on February 20, 2012. Retrieved February 21, 2012. ^ National Governors Association (2004). "Michigan Governor Gerhard Mennen Williams". National Governors Association. Archived from the original on July 1, 2010. Retrieved January 30, 2010. ^ Mackinac Bridge Authority (2010). "Prentiss M. Brown, Father of the Mackinac Bridge". Mackinac Bridge Authority. Archived from the original on December 22, 2009. Retrieved January 30, 2010. ^ Mackinac Bridge Authority (2010). "Mackinac Bridge commemorative token gift packs". Mackinac Bridge Authority. Archived from the original on December 22, 2009. Retrieved January 30, 2010. ^ "Mackinac Bridge Authority Proposes Raising Tolls to Pay for Renovations". Walker, MI: WZZM-TV. November 7, 2007. Archived from the original on February 17, 2013. Retrieved January 5, 2013. ^ Michigan Painting Group (December 2, 2007). "The Mackinac Bridge Painting Project". Michigan Painting Group. ^ Champion, Brandon (March 30, 2017). "The Mackinac Bridge Painting Project". Grand Rapids News. ^ Westaby, Robb (August 5, 2013). "Why Painting The Mackinac Bridge Is Taking 20 Years". Grand Rapids, MI: WXMI-TV. ^ Mackinac Bridge Authority (September 7, 2009). "150 Millionth Vehicle Crosses Mackinac Bridge" (Press release). Mackinac Bridge Authority. Retrieved March 19, 2010. ^ Mackinac Bridge Authority (2010). "In Memory of". Mackinac Bridge Authority. Archived from the original on September 12, 2007. Retrieved January 30, 2010. ^ "Bridge Workers". Mackinac Bridge Authority. Archived from the original on June 12, 2013. Retrieved June 18, 2013. ^ "Michigan History". Michigan History. July – August 2007. ^ Mackinac Bridge Authority (2008). "Frequently Asked Questions". Mackinac Bridge Authority. Retrieved September 23, 2011. ^ Zacharias, Pat (June 6, 2000). "The Breathtaking Mackinac Bridge". The Detroit News. Archived from the original on January 21, 2013. Retrieved September 11, 2010. ^ Propson, David (October 14, 2004). "How to Build a Better Bridge". New York Sun. Retrieved October 26, 2007. ^ McGraw, Bill (July 8, 2007). "Mackinac Bridge Q&A". Detroit Free Press. Retrieved January 3, 2014. ^ "Accident Report Claims Ms. Pluhar Was Speeding". The Argus-Press. Owosso, MI. Associated Press. November 8, 1989. p. 20. Retrieved January 3, 2014. ^ Daraban v. State of Michigan, et al. , 223659 (State of Michigan Court of Appeals March 15, 2002). ^ "Reserve Officers Died In Mackinac Bridge Crash". The Argus-Press. Owosso, MI. Associated Press. September 12, 1978. Retrieved January 5, 2013. ^ Britton, Zac (January 2, 2013). "Investigation Remains Open Following Mackinac Bridge Jump". Petoskey News-Review. ^ Ellison, Garret (January 1, 2013). "Michigan State Police Investigating Possible New Year's Eve suicide on the Mackinac Bridge". MLive. Booth Newspapers. Retrieved June 3, 2014. ^ Michiguide.com. "WNHC787 AM 530 St. Ignace / AM 1610 Mackinaw City". Michiguide.com. Retrieved September 20, 2008. ^ Mackinac Bridge Authority (2017). "Bridge to be closed to public traffic during Annual Bridge Walk" (Press release). Mackinac Bridge Authority. Retrieved July 7, 2017. ^ North Country Trail Association. "Michigan". North Country Trail Association. Retrieved July 11, 2012. ^ "Mackinac Bridge Crossings". Michigan Tourism Business. Michigan State University. 3 (1). February 24, 2004. Archived from the original on September 27, 2011. Retrieved January 30, 2010. ^ Mackinac Bridge Authority (2010). "Photo Gallery". Mackinac Bridge Authority. Archived from the original on December 22, 2009. Retrieved January 30, 2010. ^ Stokes, Keith. "New Mackinac Bridge Postage Stamp". The Mighty Mac. ^ "USPS announcement, 2010 Mackinac Bridge commemorative" (Press release). US Postal Service. ^ "2010 Stamp Designs" (Press release). U.S.Postal Service. Archived from the original on April 19, 2010. Retrieved September 9, 2010. ^ "TEACH: Building the Mackinac Bridge". teach.GLIN.net Great Lakes Information Network (GLIN). Great Lakes Commission. Archived from the original on February 6, 2017. Retrieved September 29, 2016. ^ "'Modern Marvels' Mackinac Bridge (2003)". Internet Movie Database. 2010. Retrieved January 30, 2010. ^ "Detroit Science Center To Open 'Mini Mac' Exhibit" (Press release). Detroit Science Center. June 19, 2007. Retrieved January 30, 2010 – via PR Newswire. ^ "Crew from "Dirty Jobs" in Northern Michigan". Cadillac, MI: WWTV-TV. May 23, 2007. Archived from the original on March 7, 2012. Retrieved January 30, 2010. ^ "Dirty Jobs, Season 3, Episode 5". Internet Movie Database. 2010. Retrieved January 30, 2010. ^ Michigan Department of Transportation (2007). Michigan: Official Department of Transportation Map (Map). c. 1:975,000. Lansing: Michigan Department of Transportation. Front cover. OCLC 42778335. Rubin, Lawrence (1958). Mighty Mac: The Official Picture History of the Mackinac Bridge. Wayne State University Press. ISBN 978-0-814-31817-1. Brown, Prentiss M. (1956). The Mackinac Bridge Story. Detroit: Wayne State University Press. OCLC 5392305. "Mackinac Bridge". Civil Engineering. May 1956. "The Mighty Mac at 50". Michigan History (Special ed.). 9 (4). July – August 2007. Ratigan, William (1959). The Long Crossing. Grand Rapids, MI: Eerdmans. OCLC 1686567. —— (1957). Straits of Mackinac! Crossroads of the Great Lakes. Grand Rapids, MI: Eerdmans. OCLC 3478409. Rubin, Lawrence A. (1985). Bridging the Straits. Detroit: Wayne State University Press. ISBN 0-8143-1789-8. Steinman, David B.; Nevill, John T . (1957). Miracle Bridge at Mackinac. Grand Rapids, MI: Eerdmans. OCLC 1227671. Zacharias, Pat (June 6, 2000). "The Breathtaking Mackinac Bridge". The Detroit News. Archived from the original on January 21, 2013. 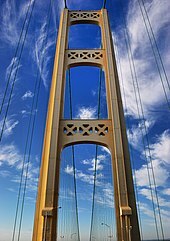 Wikimedia Commons has media related to Mackinac Bridge. Historic American Engineering Record (HAER) No. MI-329, "Mackinac Straits Suspension Bridge"
This page was last edited on 26 March 2019, at 22:51 (UTC).